Go ahead Red Sox fans: Let that headline sink in. Enjoy it. Cherish it. Be proud of the home town team. If the last few seasons have pushed you away from the club, it is safe to come back now. This team is a complete “180” of the 25 individuals from seasons past. With one game remaining in April, the Red Sox are 18-7. That is .720 ball, on pace for 117 wins. Better than the winning? This team has to be the most likable team of any sport I can remember. Since I last wrote, the city of Boston underwent the most traumatic week a city could possibly endure. During tragic events, like the Boston Marathon bombing, cities generally gravitate toward their sports teams for a sense of comfort or hope. It happened after 9/11 and it happened in Boston. The Red Sox embraced this role. Guys like Will Middlebrooks and Shane Victorino were quick to tweet out their support and love for Boston. Dustin Pedroia paid visited the victims at the hospitals. Probably most memorable was Big Papi’s quote when he addressed the crowd at Fenway Park the Saturday after that scum was apprehended. 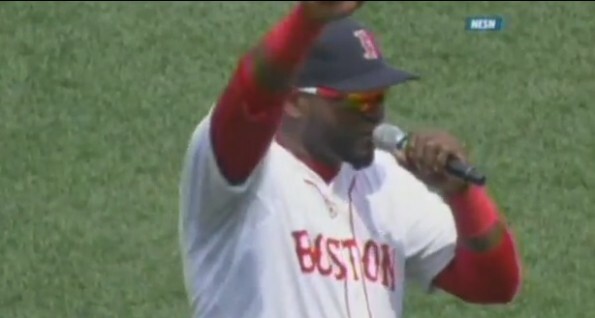 “This is our F****** city!” (And to all the people upset about Papi’s language, grow up. It was said with unparalleled emotion and it built pride in every single person that lives in that city. It needed to be said.) Best of all, the Red Sox came from behind to beat the Kansas City Royals behind Daniel Nava’s 8th inning three run blast into the bullpen. What an amazing day that was! The success the Red Sox have had can be attributed to the starting pitching. Jon Lester and Clay Buchholz have been outstanding this month. 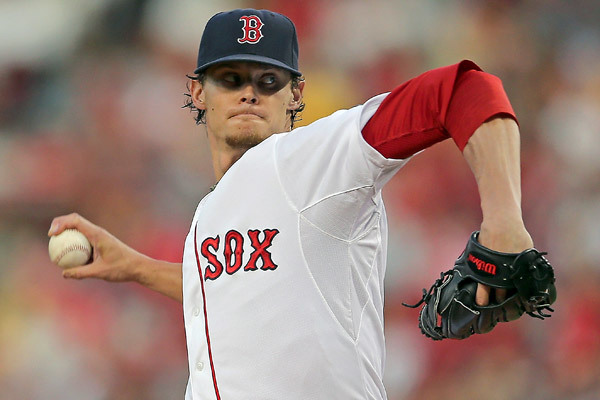 Buchholz is 5-0 with a 1.19 ERA. He has to be the early leader in the American League Cy Young debate after 1 month. Not far behind him in that race is Lester. Lester is 4-0 with a 2.27 ERA. The lesson learned here? John Farrell was a great decision to lead this ball club. Amazing what happens when the general manager gets to his job, huh Larry? With Joel Hanrahan due to come off the disabled list, it will be interesting to see if Farrell sticks with Andrew Bailey, or goes back to Hanrahan. Bailey has been very good in the closers role with Hanrahan out. I do not have a strong preference toward either guy. I think they both can do the job. What excites me is the potential to shorten the game with this bullpen. The Japanese duo has erased the sour Japanese taste out of my mouth Daisuke Matsuzaka left behind. Junichi Tazawa and Koji Uehara have been electric in the middle innings. Clayton Mortensen has been more than serviceable as a long man. If Andrew Miller ever learned o throw strikes, I might like him too. David Ortiz has silenced his critics early. Remember how upset everyone was that he was not ready for Opening Day? Remember how upset everyone was when the Red Sox signed him to a multi-year deal this offseason? Well, through 8 games Big Papi has said “shut the hell up” to his critics. Ortiz is hitting .516 with 11 runs batted in and 2 home runs. The lineup of Pedroia, Ortiz, Napoli, and Middlebrooks could be a potential murderer’s row. Napoli has been outstanding as a run producer. He set the franchise record for most RBIs in April with 27. He is currently averaging a little over 1 RBI a game! If Ellsbury and Victorino can get on base for these guys, watch out. Lastly, I understand Red Sox fans are upset with Stephen Drew. Most people are upset with him because of his genes. Others have a more valid reason to be upset. Drew is currently hitting .146. Yes, that is atrocious. In an effort to be positive on all accounts, I am going to ask the masses to silence their criticisms of Drew. I am going to go out on a limb and say he will get the average up to about .230 by the next time I write about the Red Sox. I am doing my best to write on their off days. So Stephen Drew has until May 13 to make me look like a genius. Get behind these guys! They have the pitching. They have the defense. They are playing with great energy. They are everything they haven’t been the past 3 seasons.